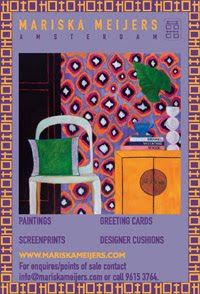 I have always been intriged by artist studios. I love to visit them and collect books & pictures of studios. 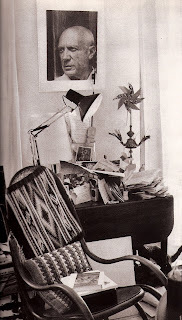 This is a picture of Picasso's atelier Notre-Dame de Vie at Mougins from a book by photographer David Douglas Duncan. I have been commissioned to design a Christmas card for a jewelry store. I have been dreaming up some earrings, but now I want them! 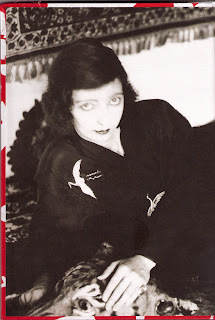 I am reading "Florence Broadhurst, her secret & extraordinary lives" by Helen O'Neill. I came across her name because I saw her amazing wall paper designs in a magazine. 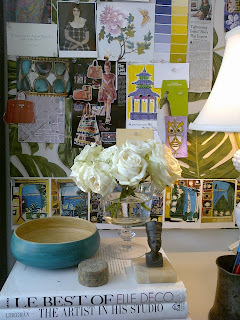 I love reading about other artists and designers, to find out what drives and inspires them. The story of Broadhurst is indeed extraordinary as only at the age of sixty!! she launched herself as a designer, founding a high-end wall paper design studio. I am a big believer in reinventing, innovating oneself. This is what keeps me passionate and full of life. Finally some time behind my easel today. 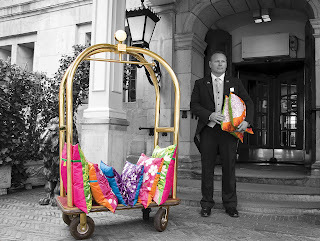 I am just a one woman band, as a start-up I simply do "the works", from designing, to sales pitches, marketing, the book keeping (aaargh my favourite part), coordinating the production of my pillows etc etc. There are days that being able to paint feels like a luxury, but it is the basis of all my creations. 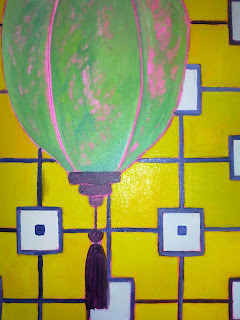 The great thing is that I never lack inspiration so when I have the time it just flows...Here is a detail. 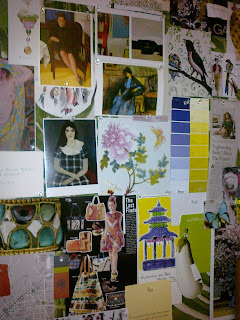 I simply can not live without my mood board. Ideas float and I pin them down. 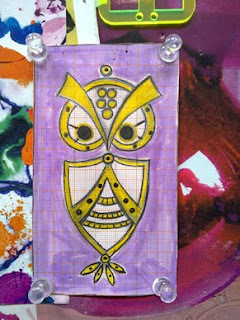 Here is a detail of my life-size mood board with a sketch that I made for my "Owl 76" throw & cushions. 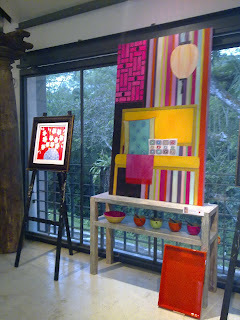 Today I received photos of the opening of my exhibition at Originals in Singapore, courtesy of Expat Living magazine. 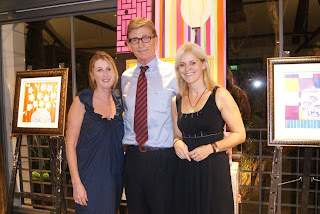 Geri, owner of Originals, and I with Dutch ambassador Johannes W. Gruvonius Jansing who was so kind to open the exhibition. Since I was I child every once in a while I have this uncontrolable urge to change my space. 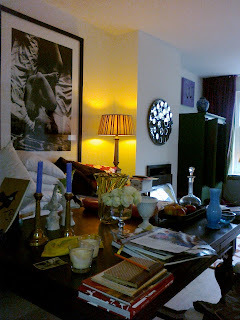 I cherish my furniture, art, nick nacks so the content of my appartment does not really change, but I am very creative moving things around. Once I start it looks like a bomb has dropped in my appartment. 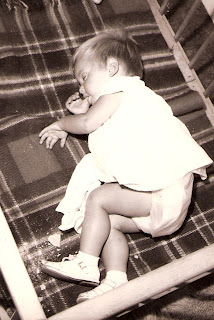 This is why my father nick-named me "Kate Chaos". One of the beauties of Amsterdam is the abundance of flowershops. 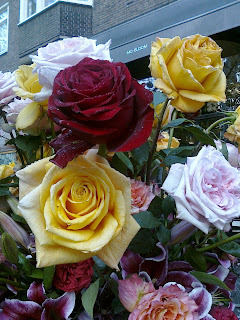 McBloom is around the corner of my house and even if I do not need flowers I often stop to look at their display. Simply divine! Today my ever stylish friend Mo advised me to go to vintage boutique "Petit Salon". Situated at one of Amsterdam's canals the "Singel". It turned out to be a real candy store, just the right thing when you need a treat. 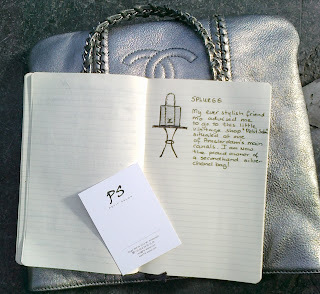 I am now the proud owner of a "vintage" silver Chanel hand bag! My new pillows have arrived today!! 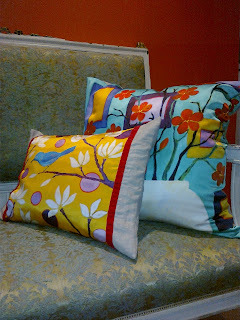 Warm yellow, mint green, rich, bold, little gems on your sofa. Light is essential. 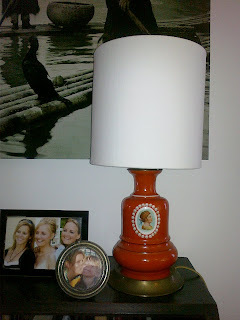 I love lamps with a history, lamps that create atmosphere. I found this lamp base a long time ago in the South of France. I fell in love with it instantly. The Hermes orange, the delicate portrait "en profile" framed with little pearls. It has also been a source of inspiration for some of my work. 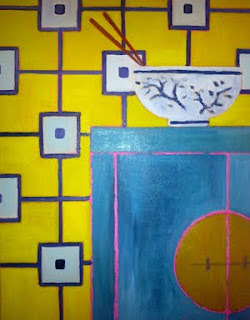 I love painting interiors & still lifes. My source of inspiration is all around me, every little corner, filled with books, flea market finds, art...My house is an oversized mood board. Today is the last day of my exhibition in Singapore. My work looked great in the space of Geri Murphy's Originals. I am happy that some beautiful pieces have found new owners! Walking in the French Quarter in New Orleans this Summer I found a great little store named after its owner Nadine Blake. 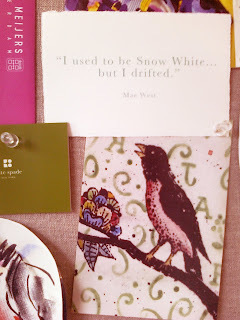 One of the things I picked up was a series of cards with quotes of Mae West, hand printed by Nadine's husband. "I used to be Snow White but I drifted" was one of them. I love quotes, especially when I can relate to them.